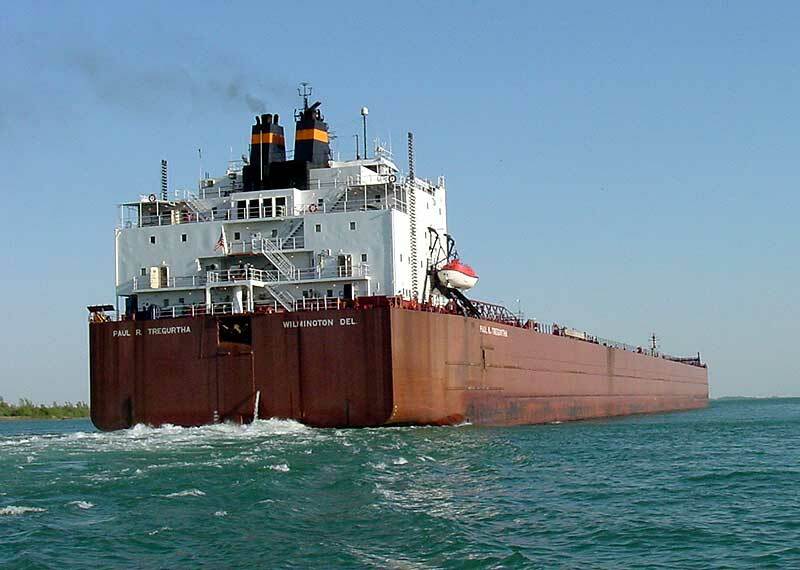 The reigning "Queen of the Lakes" title holder as the longest vessel on the Great Lakes at 1,013' 06" (308.92m) was constructed in two sections. With her keel being laid July 12, 1979; the bow and part of the cargo section was built at American Ship Building Co., Toledo, OH and towed upon completion to American Ship Building Co., Lorain, OH where it was mated with the stern portion as hull # 909 and formally launched February 4, 1981. 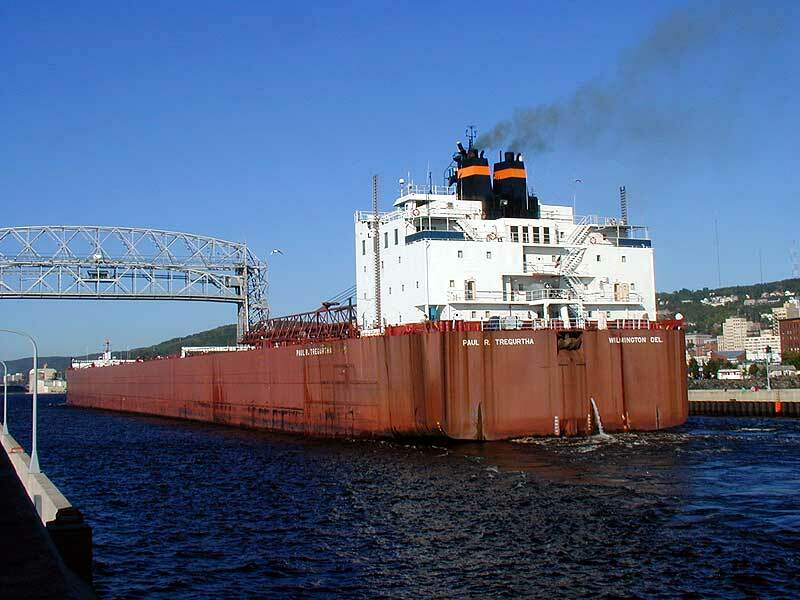 The vessel was christened April 25, 1981 as the William J. DeLancey for Interlake Steamship Co., Richfield, OH. The large self-unloader was built for Interlake's customer Republic Steel and was named in honor of its Chairman. Mr. DeLancey was in attendance and participated in the launching of his namesake. The large self-unloading bulk carrier is powered by 2 Colt-Pielstick model 16PC2-3V-400 V-16 cylinder, four stroke, single acting diesel engines each rated at 8,560 b.h.p. built by Fairbanks Morse Engine Div., Colt Industries, Beloit, WI. Burning intermediate grade 280 fuel, power is directed through a Falk single reduction gear box to twin 17' 06" (5.33m) diameter controllable pitch propellers giving the vessel a rated service speed of 15.5 m.p.h. She is equipped with a 1,500 h.p. bow thruster. Equipped with 36 hatches servicing 5 holds; the vessel is capable of carrying 68,000 long tons (69,092 mt) of iron ore at a mid-summer draft of 30' 01" (9.17m) or a cubic capacity for 71,250 net tons of coal (equivalent of 63,616 long tons by comparison). Her Stephens-Adamson design loop belt elevator system feeds a stern mounted 260' (79.25m) discharge boom that can be swung 100 degrees to port or starboard and is capable of unloading at a rate of 10,000 tons (10,161 mt) of ore per hour or 6,000 net tons of coal per hour. The self-unloader displaces 14,497 tons (14,730 mt) lightweight. 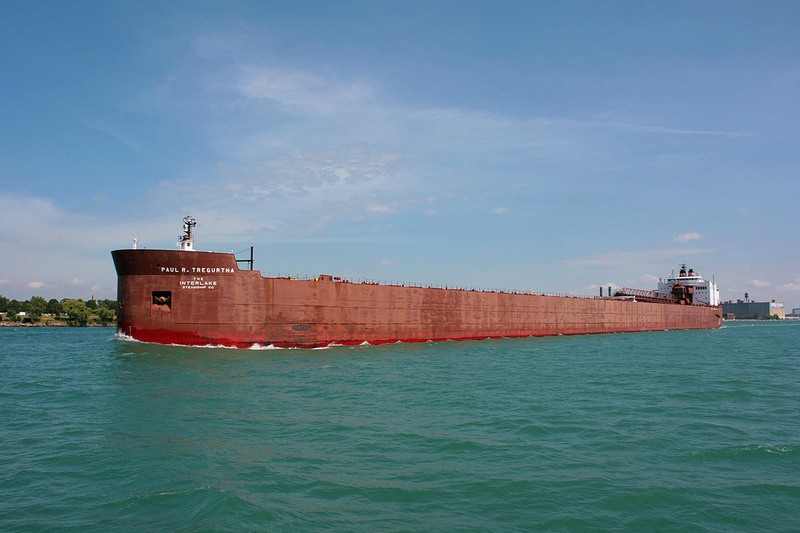 The William J. DeLancey was designed specifically for carrying ore for Republic Steel from Lake Superior ports to their mill at Indiana Harbor, IN or to their transshipment terminal at Lorain, OH. Built at an approximate cost of $60 million, she became the flagship of the Interlake fleet. Included in her construction were elaborate luxurious passenger accommodations to be used by Interlake's most important business customers. For her crew, the William J. DeLancey's construction included air conditioning throughout, elevators, and luxurious décor in the dining, mess rooms, and crew's quarters. She was thusly and affectionately given the nickname "Fancy DeLancey". 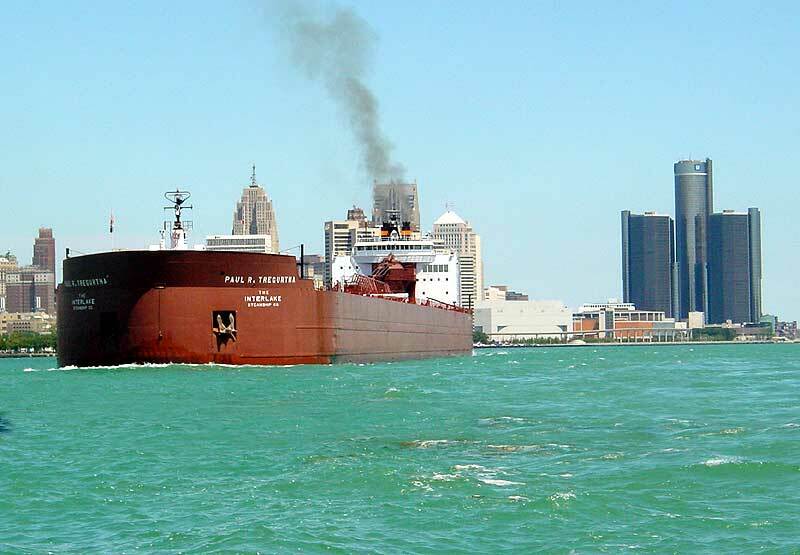 The William J. DeLancey was the last of the 13 "thousand footers" to enter service on the Great Lakes and was also the last Great Lakes vessel built at American Ship Building, Lorain, OH. This large self-unloader has held the "Queen of the Lakes" title longer than any other lake boat. Only the steamer Carl D. Bradley which held the "Queen of the Lakes" title from April 9, 1927 through until June 28, 1949; a period of just over 22 years, has come close to the reigning "Queen's" tenure. 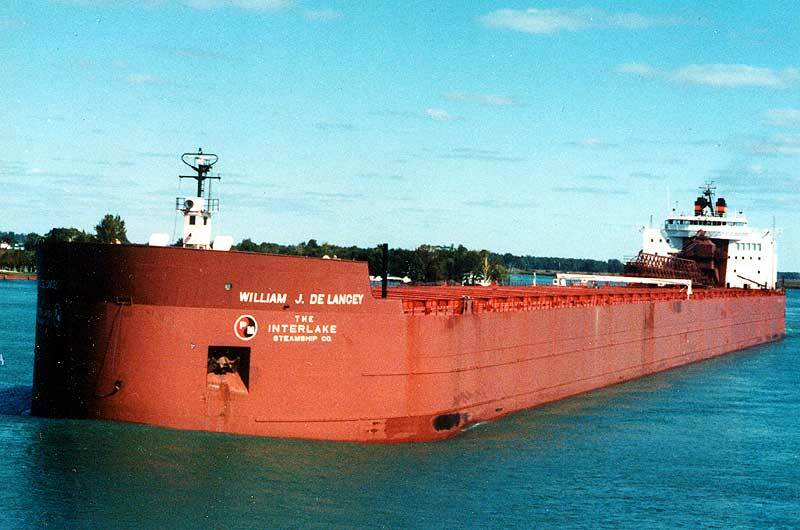 The William J. DeLancey departed Lorain, OH on her maiden voyage May 10, 1981 sailing in ballast to Silver Bay, MN loading 55,944 tons (56,843 mt) of iron ore pellets for a return trip back to Lorain, arriving back on May 16, 1981. Throughout the early and mid 1980's, the William J. DeLancey regularly established cargo records. 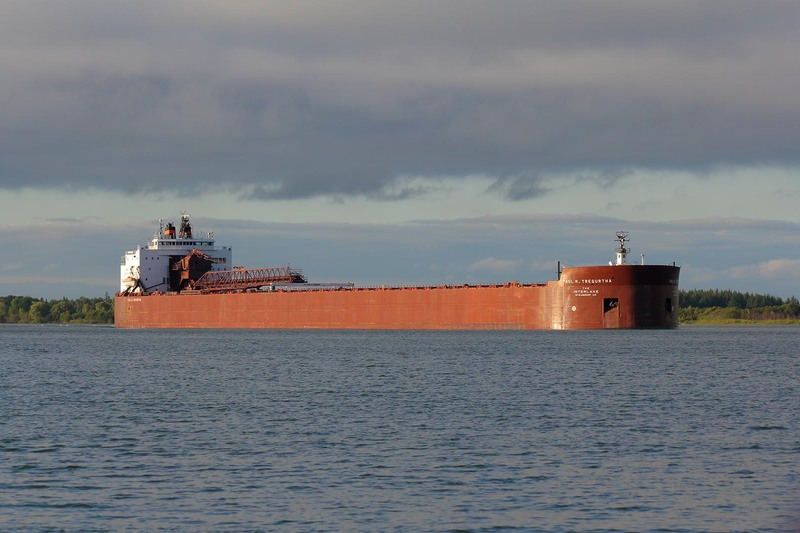 On October 19, 1981; a Great Lakes record 62,212 tons (63,211 mt) of iron ore was loaded at Escanaba, MI. 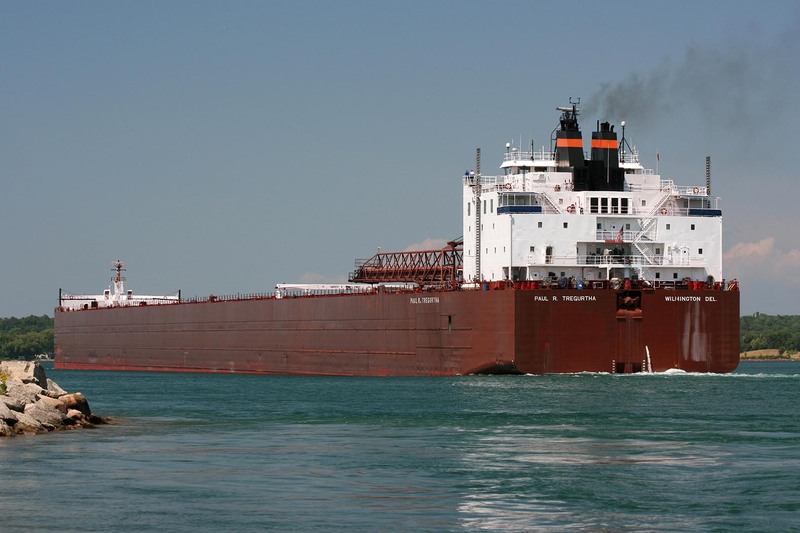 Then, on July 30, 1982; 62,701 tons (63,708 mt) of iron ore was loaded at Escanaba for Indiana Harbor; only to follow up with a 63,007 ton (64,019 tonne) load on August 7, 1982 also from Escanaba to Indiana Harbor. This particular load was due to an increased 2.5" (6.35cm) draft allowance. The William J. DeLancey's first 71 cargoes totaled 4,151,398 tons (4,218,086 mt); averaging 58,450 tons (59,389 mt) per load. These cargoes were usually from Silver Bay to Lorain (less draft) and Escanaba to Indiana Harbor. 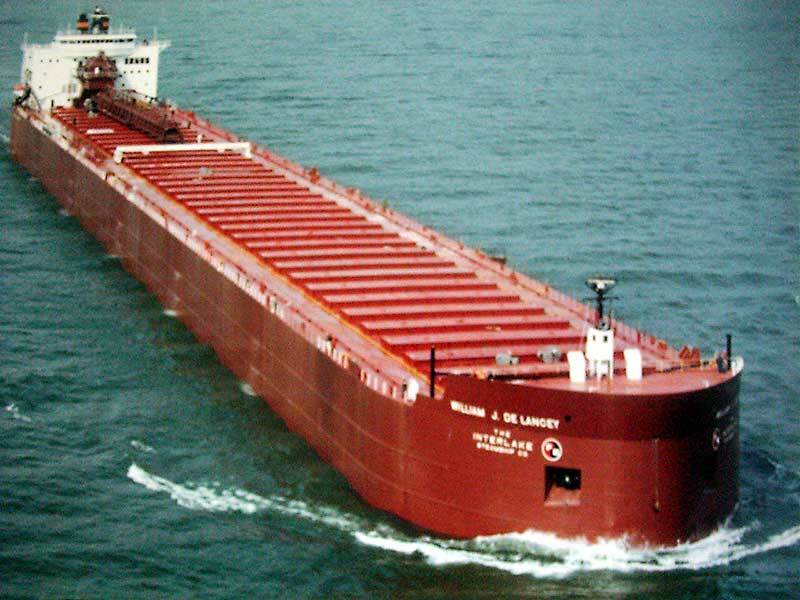 On July 20, 1983; the vessel broke the Lorain port record delivering 61,846 tons (61,846 mt) of iron ore pellets from Escanaba. 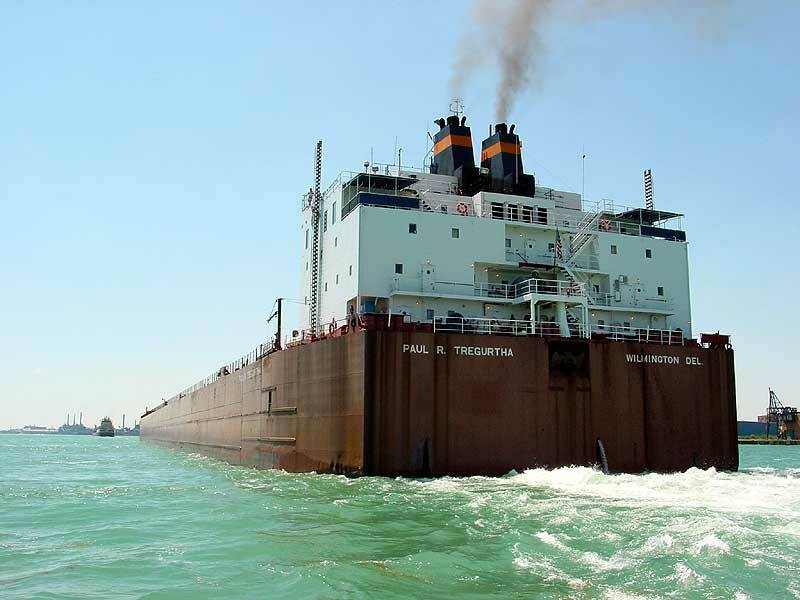 She then established a lower lakes record by loading 50,239 net tons of coal from Ashtabula to Consumers Power, becoming the largest cargo loaded on the lower Great Lakes. 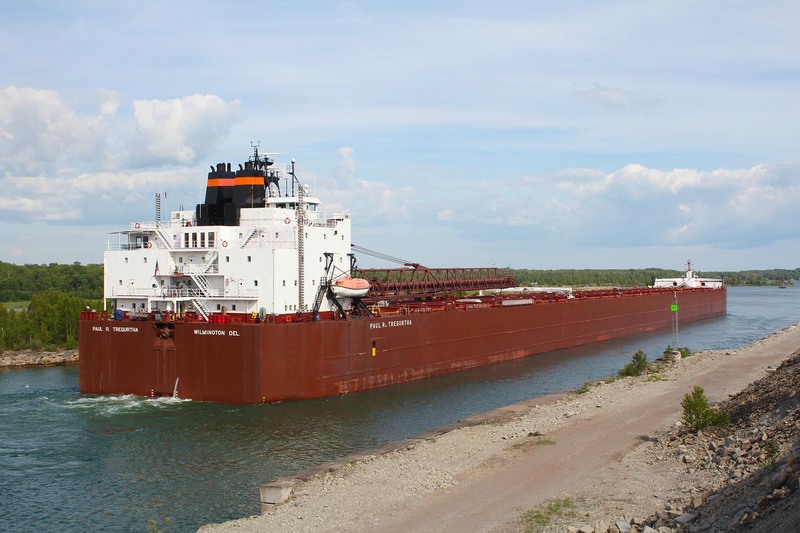 Of a more recent note, this vessel is recorded to have carried the most cargo through the Soo Locks during the 2001 navigation season: 3,004,957 net tons. 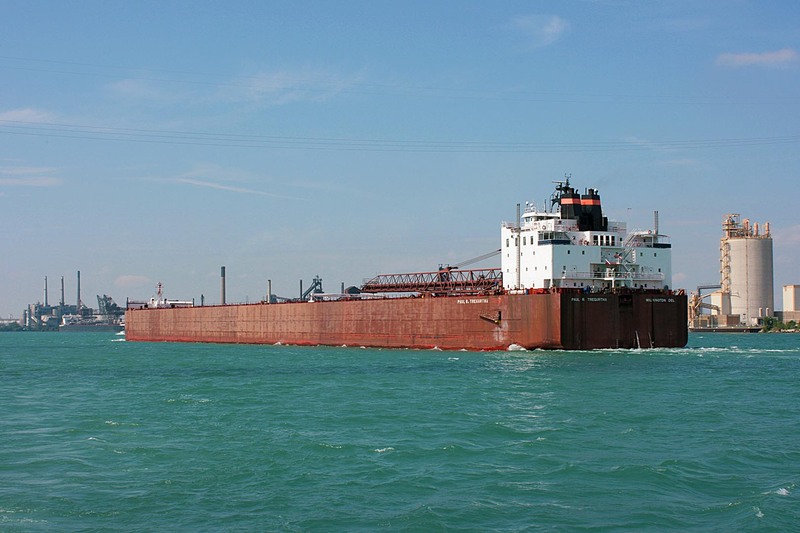 On October 29, 1986, the William J. DeLancey rendered assistance to her fleet mate James R. Barker, who had suffered an engine room fire while upbound on lower Lake Huron. The two vessels were lashed together side-by-side. The pair of "thousand footers" proceeded to Sturgeon Bay, WI where the James R. Barker was dropped off for repair on November 2, 1986. 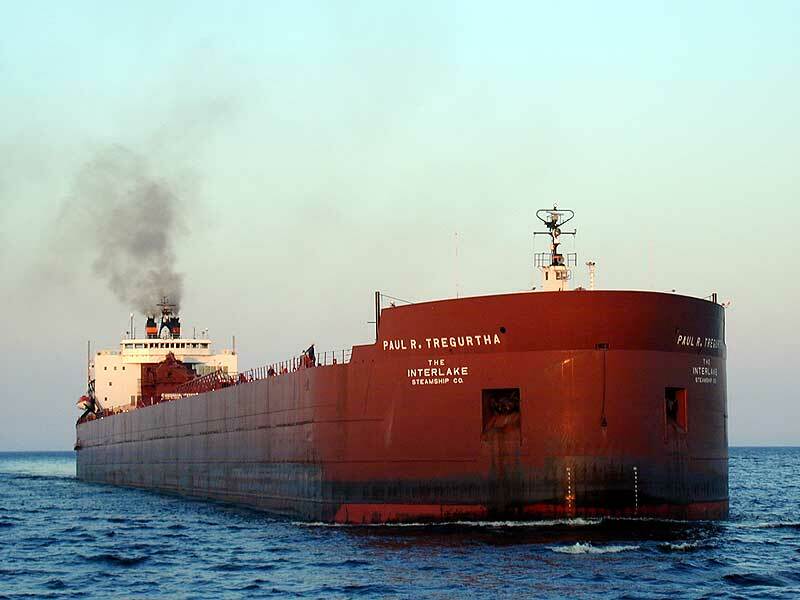 The William J. DeLancey was rechristened Paul R. Tregurtha at Sturgeon Bay on May 23, 1990. 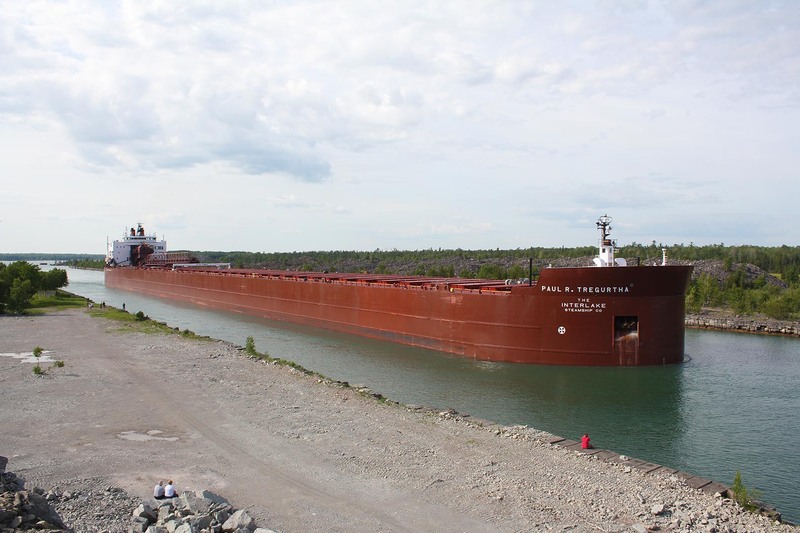 The vessel was named in honor of Mr. Paul Richard Tregurtha; Vice Chairman of Interlake Steamship Co., and Chairman, C.E.O., and 50% owner of Mormac Marine Group, Inc. (owner of Interlake Steamship Co.) . 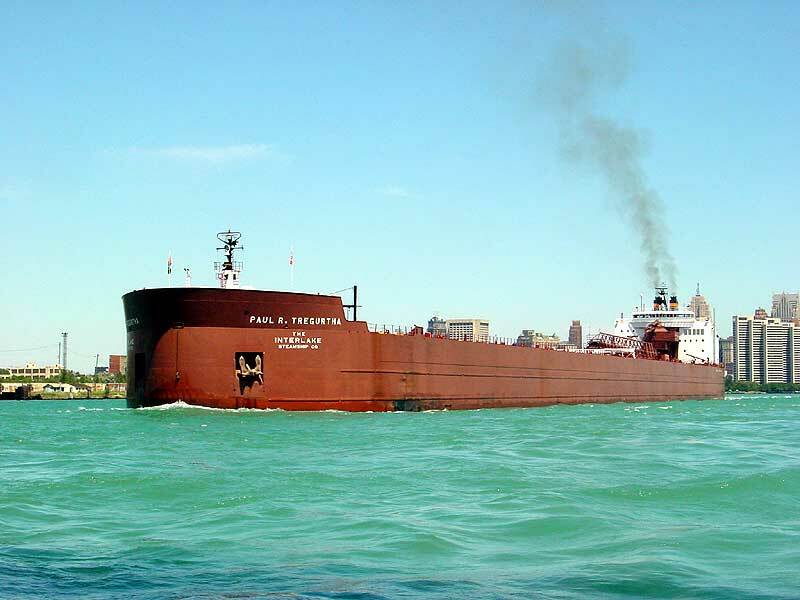 As the Paul R. Tregurtha, in April of 1992 the vessel was noted to have had a collision while docking at Detroit Edison, St. Clair, MI damaging her #1 port ballast tank. 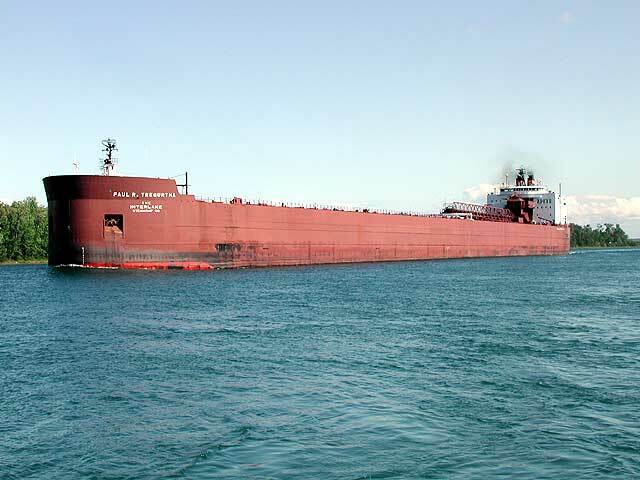 On December 18, 1997; the vessel damaged both her # 1 port and starboard ballast tanks while docking in Cleveland. 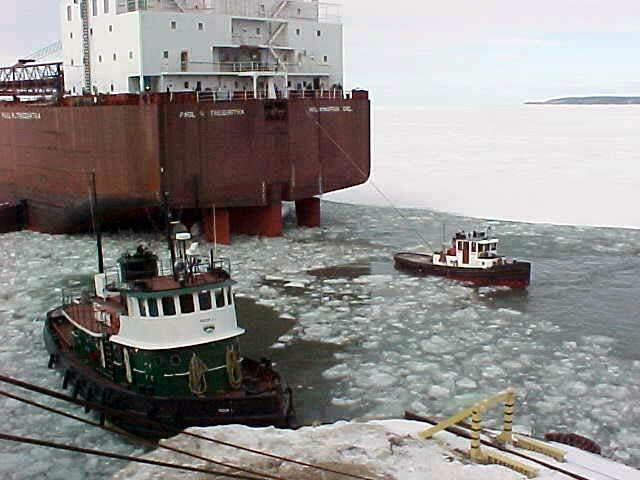 The vessel grounded December 20, 1999 on a shoal in East Gate Basin, Duluth. With no damage being found, the Paul R. Tregurtha was cleared to sail, only to ground again in the same spot the next day. The vessel was lightered by the Canadian Enterprise until she refloated; the cause of both groundings due to recent shoaling in the area. 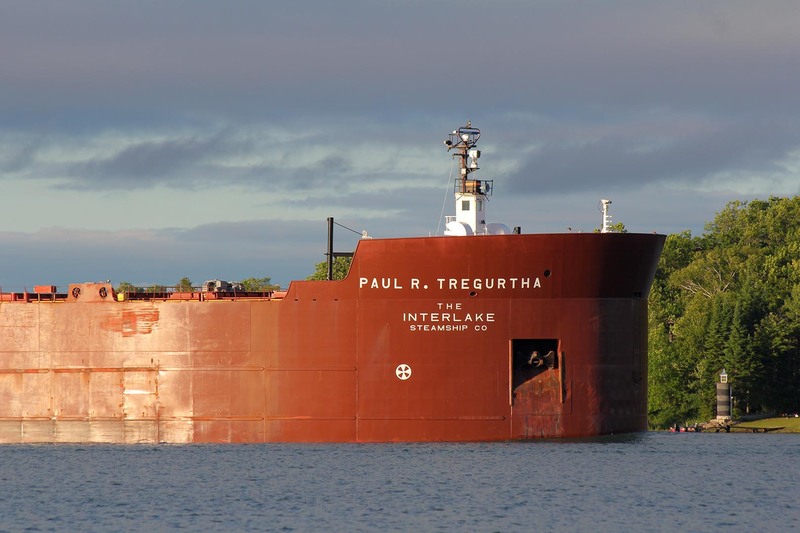 The Paul R. Tregurtha also grounded at Sault Ste. 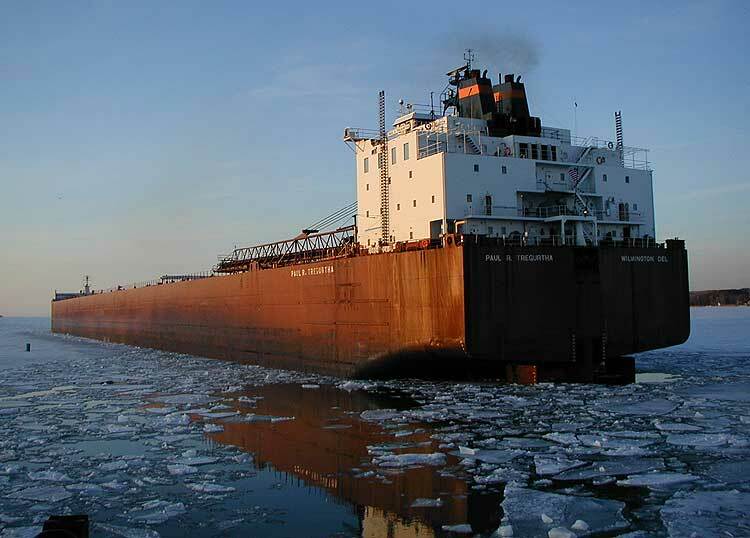 Marie January 7, 2001 causing bottom hull plating damage and was allowed to proceed to St. Clair, MI to unload before proceeding to Sturgeon Bay for repair. 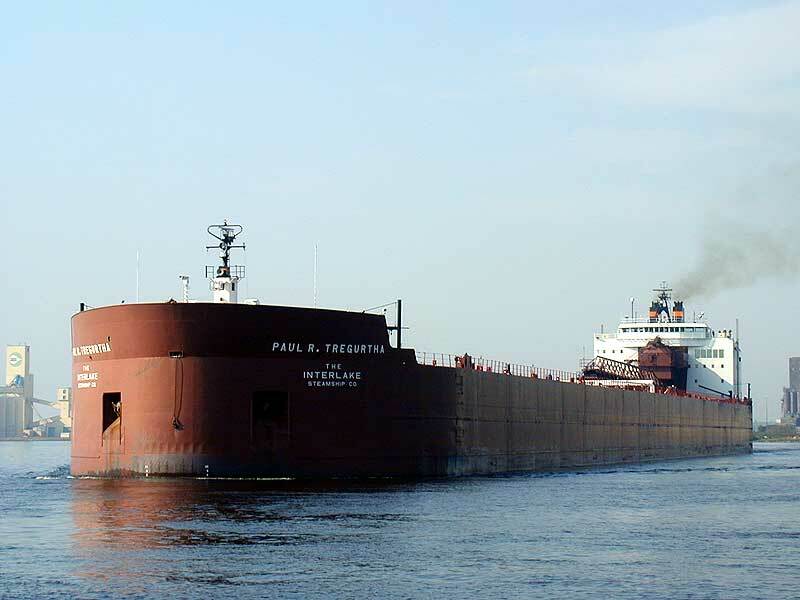 The Great Lakes marine industry was saddened to learn of the passing of the Master of the Paul R. Tregurtha; Captain Mitch Hallin, on May 3, 2002. 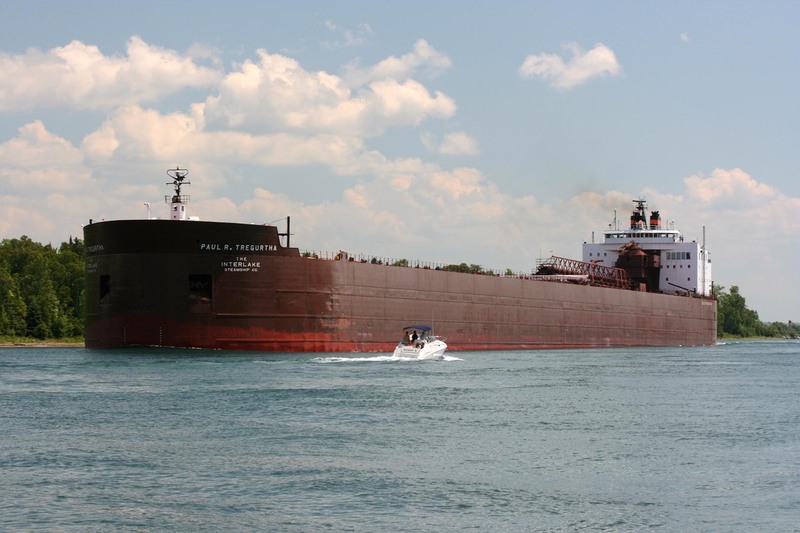 The much respected 55 year old Captain Hallin passed away in his cabin while his vessel was on Lake Superior above the Soo Locks. Born in Bagley, MN May 11, 1946; Captain Hallin had resided much of his life in Duluth before relocating in Phoenix. 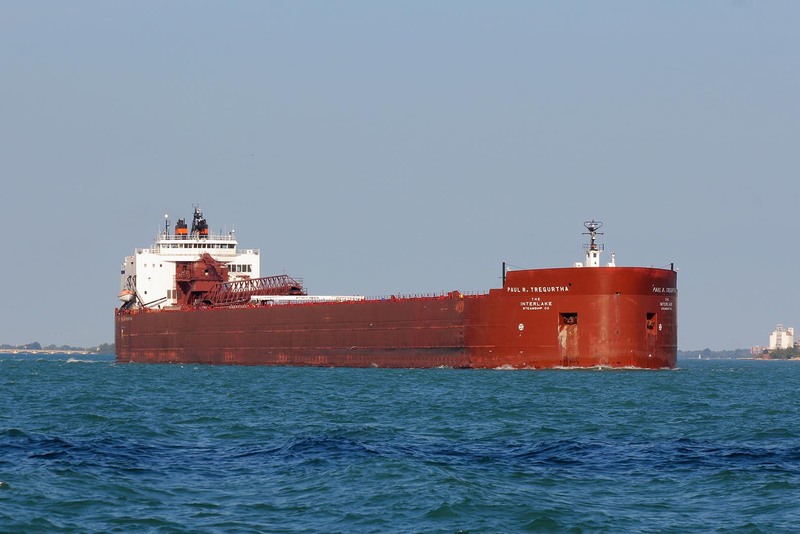 He had been with Interlake Steamship Co. since 1973 serving on their vessels Harry Coulby, Mesabi Miner, Herbert C. Jackson, Elton Hoyt II, Charles M. Beeghly, James R. Barker, and Lee A. Tregurtha. Captain Hallin had been Master of the Paul R. Tregurtha since fitout, 1993. 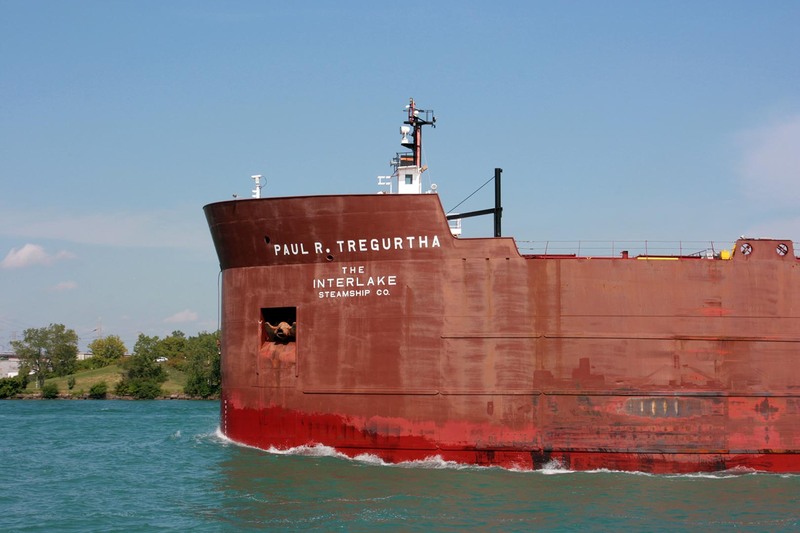 The Paul R. Tregurtha's 2004 navigation season closed in an unusual manner with a rare mid-winter cargo of coal from Conneaut, OH to the Carbide Dock in Sault Ste. Marie, MI. 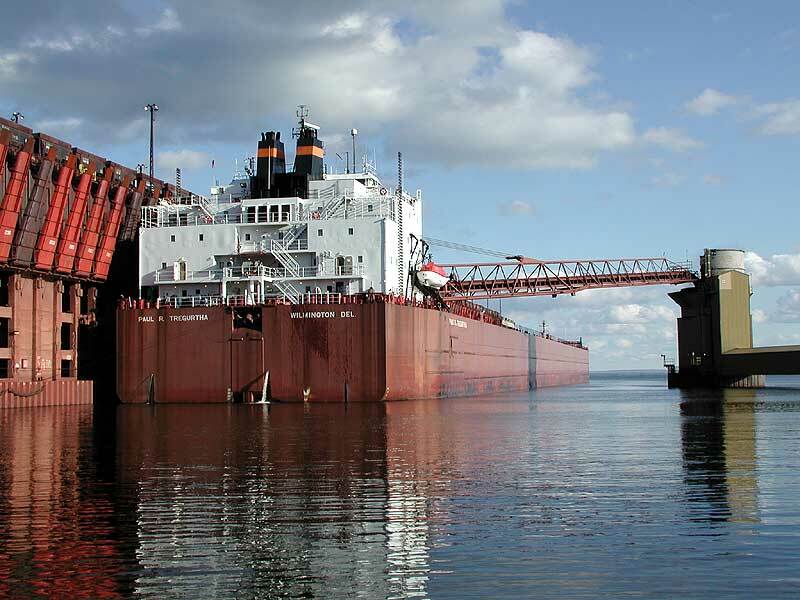 After some delays in loading the 43,000 net tons of frozen coal in Conneaut, the self-unloader arrived at the Carbide Dock on January 28, 2005. Both U.S. and Canadian Coast Guards provided ice-breaking assistance so that the voyage was completed without any delays. 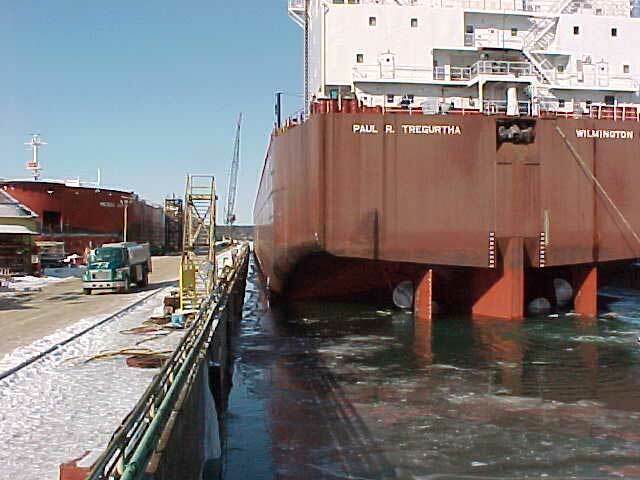 Unloading was completed on January 29 after which the Paul R. Tregurtha departed Sault Ste. Marie for its winter lay-up at Sturgeon Bay, WI. 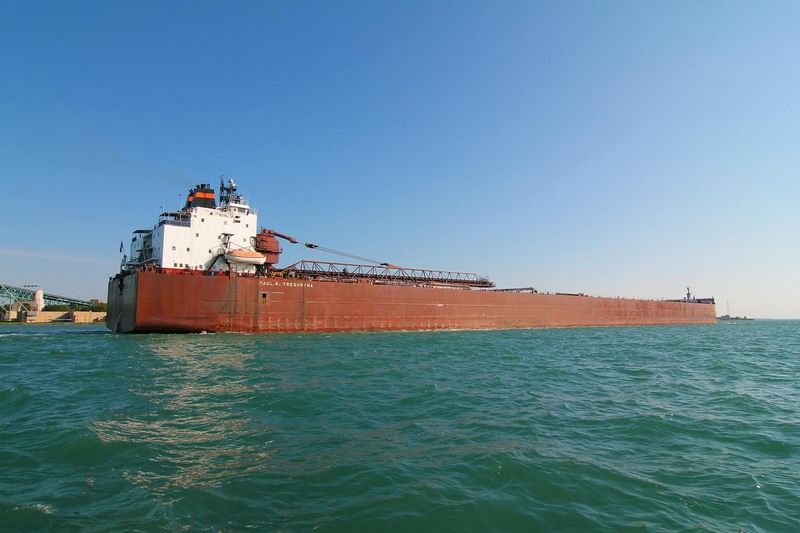 The coal cargo was for Algoma Steel in Sault Ste. Marie, ON as a reserve for winter operations. 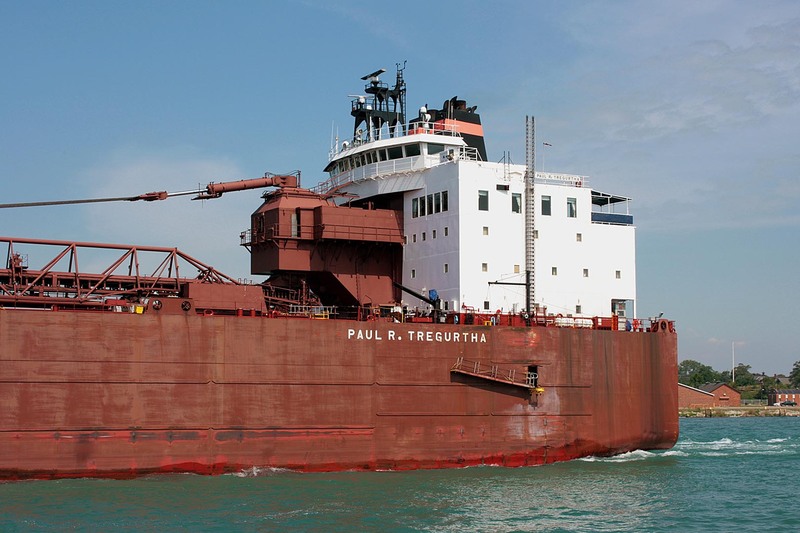 On November 9, 2009 the Tregurtha laid up at Bay Shipbuilding, Sturgeon Bay WI for a scheduled winter repowering project. Her twin Pielstick diesels were removed and replaced by a pair of medium speed MaK M43C 6 cylinder diesel engines providing a combined 17,120 BHP. Returning to service in April 2010, this re-investment reaffirms Interlake`s commitment to reliable and dependable service to their customers, and ensures a long and productive future for the Paul R. Tregurtha. 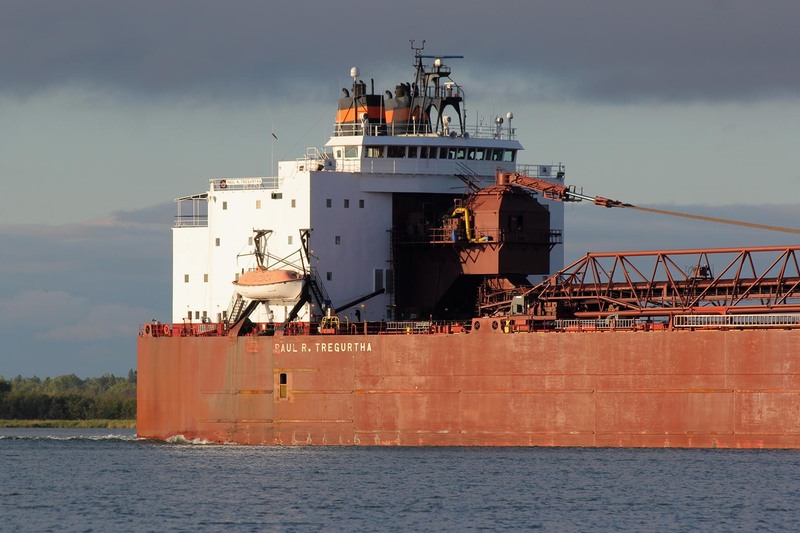 In the early morning hours of August 15, 2012, the Tregurtha, loaded with 62,000 tons of coal, grounded at the narrow entrance to the Rock Cut on the St. Marys River. Blamed on pilot error, the ship started the turn too late forcing in the vessel's starboard bow hard aground on a rocky shoal with the stern also finding bottom after the river's current pushed it onto the bank. 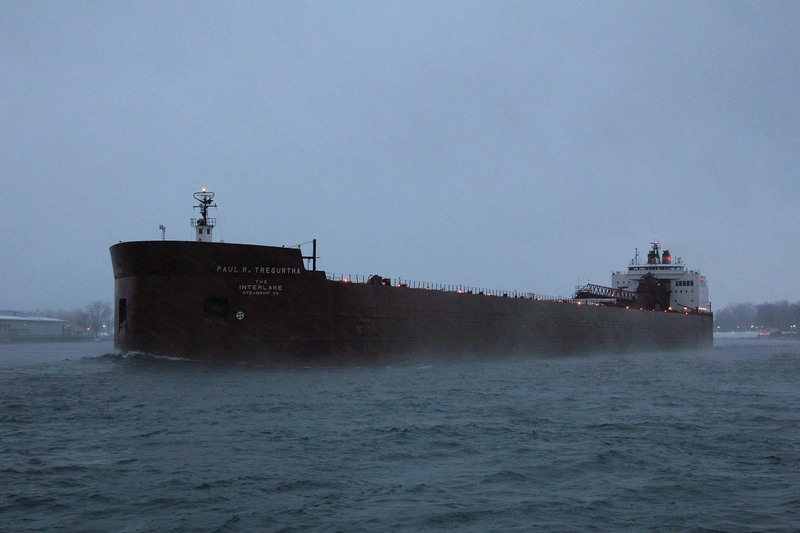 With the ship effectively blocking the channel, 11 downbound vessels were delayed for more than a day. 27 hours after the grounding, the G tugs Florida and Missouri were able to free her. 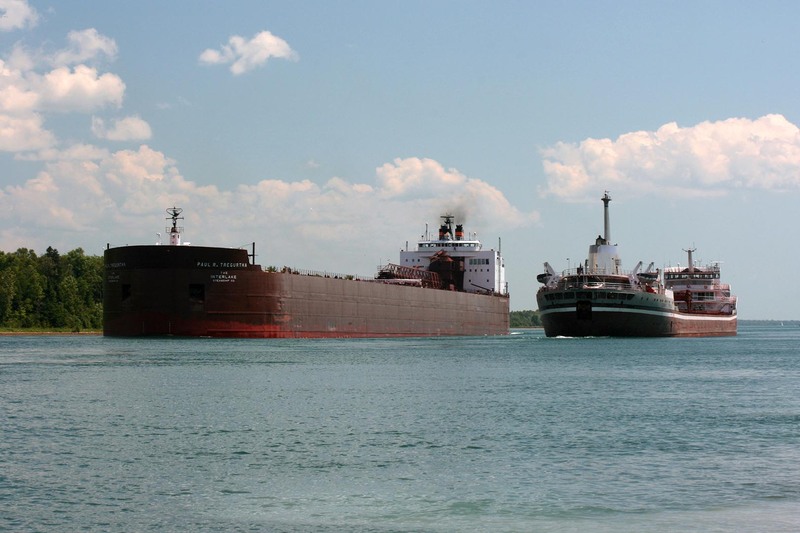 Significant damage was suffered to her to her bow and port rudder, requiring extensive repair that was completed at Bay Shipbuilding, Sturgeon Bay WI within 30 days of the incident. During winter layup 2017-18, the Paul R. Tregurtha was equipped with an exhaust gas scrubber system to reduce sulfur emissions. Exhaust gas from the engines is sent through a series of absorption sprays that wash and remove impurities, specifically sulfur and particulate matter. That washed exhaust gas then travels through a droplet separator before a clean plume of white steam is discharged into the atmosphere. Under construction in Lorian, 1980. Sea trials of the DeLancey. As the William J. DeLancey in 1982, St. Marys River. Heading into Lake Huron, 1983. Cold and foggy day on the river, Jan. 1995. 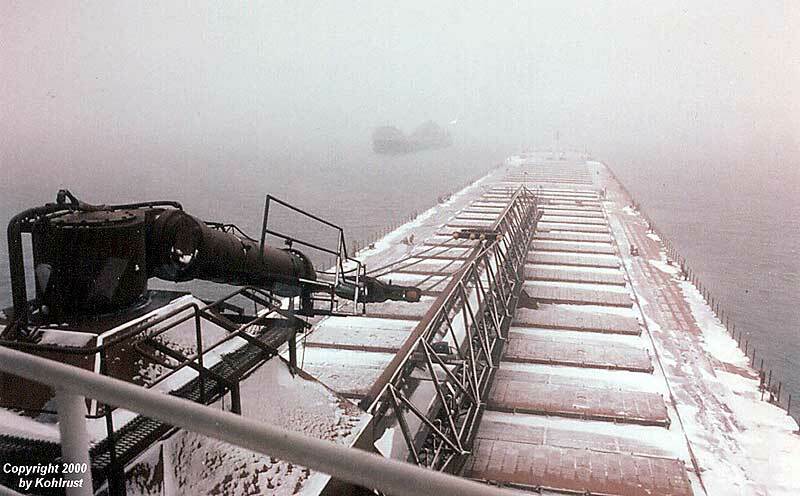 Entering Duluth with the temperature at -15 degrees, Dec. 23, 1998. Loading at night in Superior, 1999. Unloading on the St. Clair River, Oct. 30, 2000. Assisted into Bay Ship, Jan. 21, 2001. Rudder and propellers can be seen, Feb. 10, 2001. Departing winter lay-up at Bay Ship, March 18, 2001. Panoramic passing St. Clair, March 31, 2001. Downbound on the Detroit River, April 2001. Aerial view in Lake Huron, March 29, 2002. Loading in Escanaba, May 13, 2002. Stern view on the Detroit River, June 1, 2002. Unloading coal in Marquette, June 29, 2002. Paul R. Tregurtha (1,013'6") dwarfs the saltie Johanna-C (292' 0"), July 25, 2002. View from the Westcott mailboat, Aug. 2002. Upbound at Mission Point, Aug. 19, 2002. Inbound Duluth, Sept. 6, 2002. In Duluth Harbor, Sept. 7, 2002. Entering Duluth, Sept. 12, 2002. Another load of coal for Marquette, Oct. 5, 2002. Upbound in the St. Marys River Aug. 12, 2003. Deptarting the power plant on the St. Clair River, Oct. 17, 2003. At the Soo, May 2004. 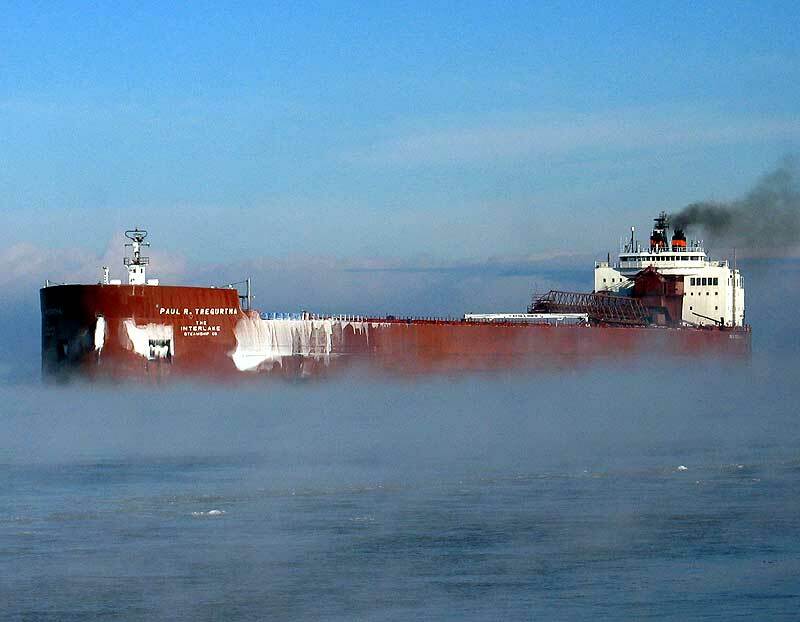 Cold Port Huron Passage, Dec. 27, 2004. Cold trip to Sault Ste. Marie, Jan. 28, 2005. 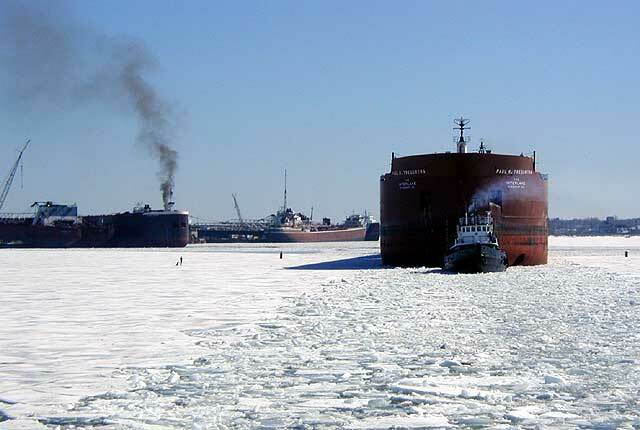 Leaving Duluth / Superior, March 27, 2005. Passing the Edward L. Ryerson below Mission Pt., July 6, 2007. Laid up for the winter in Sturgeon Bay with the American Spirit, Philip R. Clarke, and American Courage along side, March 21, 2010. Downbound in the St. Marys River, July 25, 2010. Entering Duluth through the piers, April 11, 2010. Pumped out for bow thruster repairs, Oct. 17, 2010. 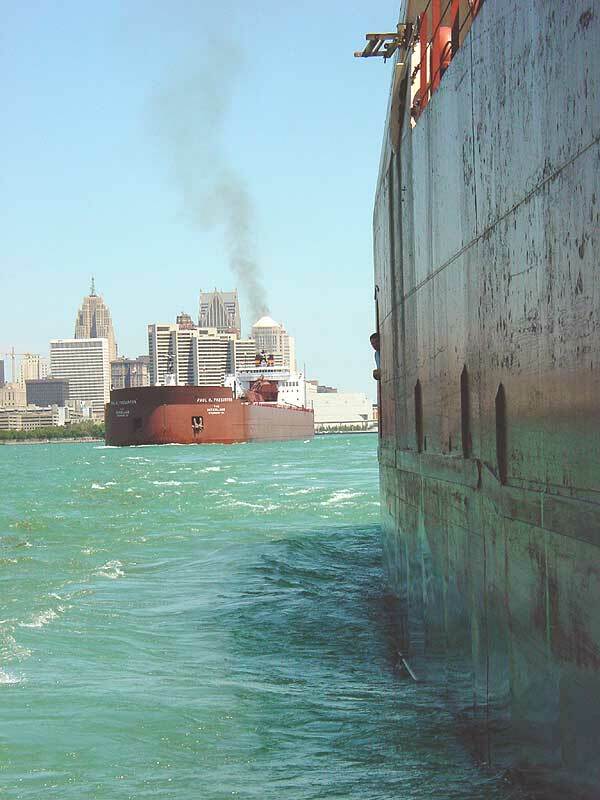 Downbound in Detroit, Aug. 4, 2012. Aground just north of Rock Cut with the Missouri standing by, Aug. 15, 2012. View from the Neebish Island ferry dock. Passing through Rock Cut, June 29, 2013. The Challenger’s pilothouse was carried from layup in Sturgeon Bay to Toledo for future installation at the National Museum of the Great Lakes, March 28, 2015. 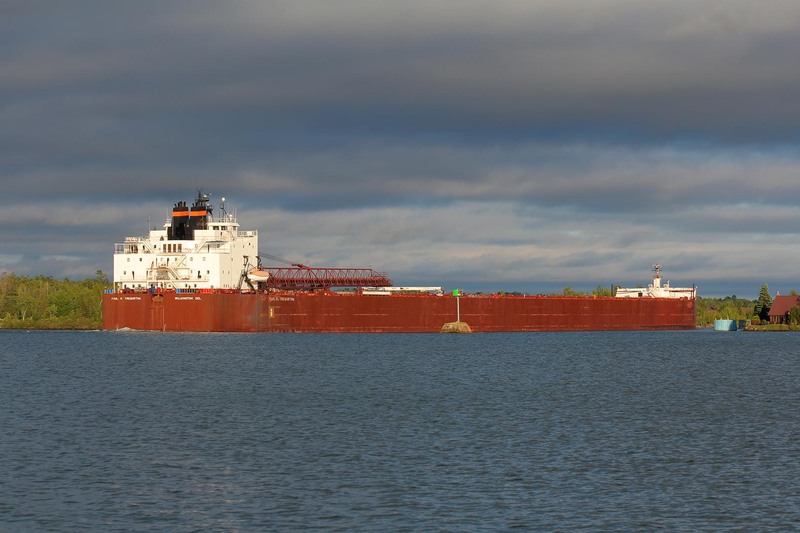 Coming into Escanaba to load with the Challenger's pilothouse, April 1, 2015. 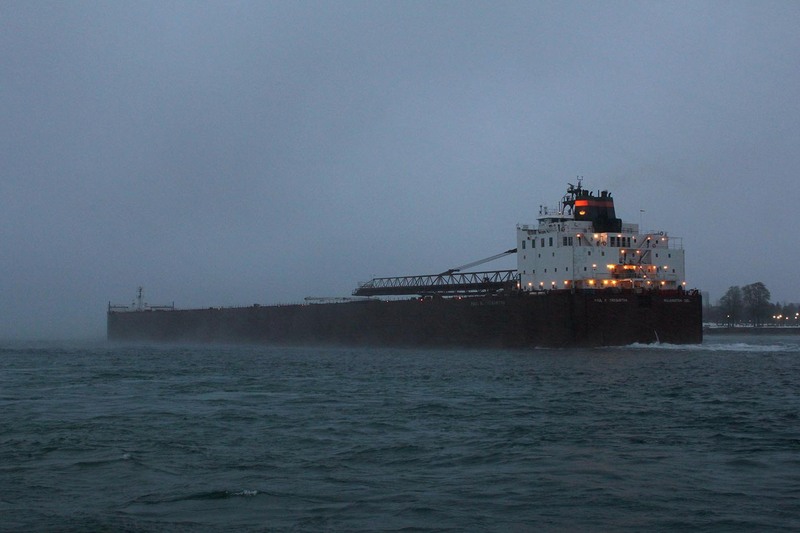 Upbound in Port Huron in the sleet & rain, Nov. 21, 2015. Upbound at Sarnia with the Rosaire A. Desgagnes behind, May 31, 2016. Down at buoys 1 & 2 above Port Huron, June 11, 2016. Heading into Lake Huron upbound, June 18, 2016. Bow on view approaching St. Clair, July 21, 2016. Approaching the turn to Rock Cut, July 1, 2017. Downbound in Detroit, Sept. 5, 2016.